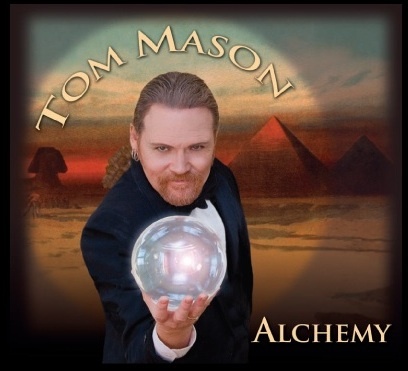 Bronson's Music - Tom Mason "Alchemy"
My Reviews - Tom Mason "Alchemy"
I've known Tom Mason 15 years now and I've always thought of him first and foremost as a musician. I knew he was a songwriter and a singer, but if someone would have asked me to describe Tom with one word before today, it would have been easy. Musician. After just listening to his new all original 13 song CD release, "Alchemy", my one word answer would have to be, Artist. Found in type on the back cover of this CD; 13 extraordinary tales of conjurors, healers, virtuosos, pirates, lovers, and sojourners! Yes, and that's exactly what it is, and after you listen you will agree. This independent release isn't about being commercial, it's about a great artist sharing his musical creations. To me, "Alchemy" is just that, musical art that draws off Tom's personal experiences and travels as he mixes in historical facts, places, people, imaginary and real life situations. It's cosmopolitan in many ways, with an international musical flavor to back up his voice and lyrics. Being the multi talented musician that he is, Tom plays many instruments on these 13 songs. Guitar, dobro, mandolin, accordion, harmonica, and trombone. His choice of musicians and singers to play on this masterpiece are some of the best you could find anywhere. Sheila Lawrence, Jim Gray, Mark Horn, Jen Gunderman, Martin Lynds, Craig Wright, David Jacques, Jody Nardone, Pru Clearwater, Paul Gannon, Joey Spampinato, Jill Block, Michael Jeffers, Billy Block and Clint Hoover. The artwork, design, and packaging of "Alchemy", just adds to the excellence of this independent release. An illustrated book of the lyrics and credits enhances the listening experience as you read along while listening to Tom sing and speak his wonderful songs. Again, "Alchemy" is a musical experience, it's art, it's beauty, it's an artistic statement by someone who's been down the road and back. I would imagine commercial radio will snub it's nose at this recording, which is sad, because it needs exposed to the masses as all great art should be. My hats off to Tom Mason on this his latest release, and to all who were involved. This recording will hold up over time, you can bet on that, because it's really really good and not based on any musical trend or fad. Great songs, great musicians, you can feel the fun they were having as they recorded these songs and vocally, Tom delivers each song with such emotion and sincerity, his voice takes it over the top. Buy this record, seek it out. You'll be glad you did because "Alchemy" is special. It's one of a kind and a real treat. Thank you Tom for making this record and sharing your songs, your music, and your talent.